90s Child: Titanic. Nothing on earth could come between us, except the fact that I was too young to go and see you in the cinema. Titanic. Nothing on earth could come between us, except the fact that I was too young to go and see you in the cinema. 4th April 2012. This date is a massive deal for me. Why? you ask. Why is a random Wednesday that will probably be raining or cloudy, is still ages away from summer is not my birthday such a massive deal? Yes, that's right. This is the day that Titanic is released in cinemas. And I'm finally old enough to go and see it. I remember the first time around. It was the beginning of 1998 and I was ten years old. Too young to really appreciate the truly massive hype surrounding the 12 rated film but old enough to want to go. Badly. No wonder I was so bothered, it was in your face everywhere you went. On breakfast radio before you went to school, in tv adverts when you got home from school. Everyone was talking about it. It's not like I was even invested in it for any particular reason. I was a bit too young (at that point anyway) to be a Leo fangirl and I wasn't a die hard action fan. But what I did know was that this film was being talked about, that it looked epic, and I wanted to go. So you can imagine how difficult this must have been for a relative of mine, who for some reason was around our house on the night he was due to go and see it. I can't remember much from 1998, it was a long time ago, I was only ten. But I remember this. All through dinner I had been begging, pleading to go with them only to be told something to the effect of, 'We would take you, but it's a 12. You won't get in, then we won't get in and none of us will be able to see it.' I can see their logic now, but as a ten year old kid watching them walk out the door on that cold February school night to see the biggest. film. ever. it didn't seem all that fair. Why couldn't 12As have been invented then? So, needless to say I didn't get to see Titanic in the cinema. I did however get to see it when it came out on video the next Christmas, when I still wasn't 12, but luckily no one seemed to care. Words cannot describe how much I loved that movie. It gave me nightmares and I didn't sleep that night but it was worth it. 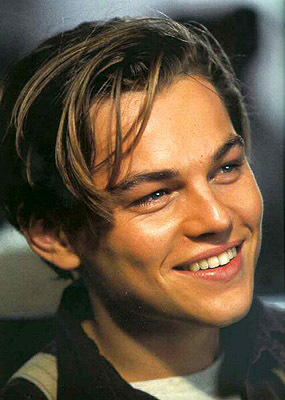 I loved Leo and his boyish good looks. I wanted to be Kate. I liked Celine Dion's cheesy song at the end. 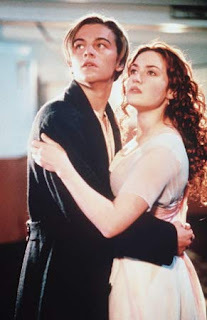 I wondered why, when they were on the raft at the end, Kate told Leo she would never let go and then she let go of his hand and left him to plummet to the bottom of the ocean. 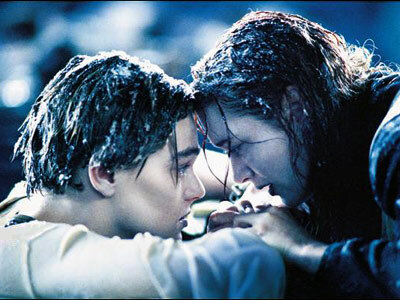 I know he was dead by then, but couldn't she have moved up a bit on the raft before that? Was there really no room at all for Leo? Anyway, whilst I was lucky enough to see it, I had a friend at school who was about as desperate to see it as I had been. Unfortunately she had to wait all the way until she was actually twelve years old. Her excitement for the film did not die, and one and half years after it hit the big screen, a group of us watched it around her house on the small screen at her twelfth birthday sleepover. She loved it about as much as I did (which was a lot), and we even ended up performing Celine Dion's 'My Heart Will Go On' with her fantastic singing and my clumsy but enthusiastic keyboard playing at a school assembly. 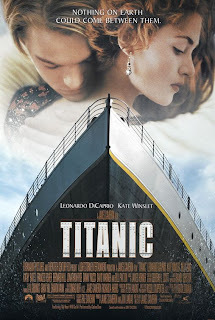 So this April I'm gonna make like it's 1998 and go and see Titanic in its second release in 3D. I simply have no choice, it would be wrong if I didn't go, like I was betraying Leo and Kate and my ten year old self.